Fulton Lodge #69 and Benjamin Franklin Lodge #83 will jointly be holding a Trap Shoot on Sunday, October 14, 2018 at Tronnes’ Pond located at 855 Washington Road, Edgerton, WI. Bro. Austin Tronnes has been kind enough to let us use his private shooting range, and all Masons and their guests are welcome. $5 at the door to cover the cost of pigeons, and food will be available. Bring your own ammunition and some quarters for games. Don’t have a gun? Bring ammunition for 12ga shotguns, as we should have some extra shotguns to loan. Chili to be sponsored by Tobacco City Firearms. Fulton Lodge will be opening its doors to the public on Wednesday, August 1, 2018. Everyone is invited to tour our historic building, learn about our fraternity, and meet the brothers that make Fulton Lodge #69. Hamburgers, hot dogs, and other refreshments will be available for everyone. There is no cost for this event. Doors open at 6:30 p.m.
Coffee begins at 8:30 a.m. with District Meeting to begin at 9:00 a.m. Featured speakers will include Jesse Furrer with an update on insurance, Lauri Eckmann with Live Better at Home, and Rich Rygh will speak about media relations. The Right Worshipful Deputy Grand Master will also address the meeting. Be sure to bring pencils, pens, paper, your phone, and a copy of your Lodge roster along with your Lodge’s plan for membership retention and growth. Your District 9 Team looks forward to seeing you there! Fulton Lodge № 69 is hosting a Veterans Appreciation Dinner on Thursday, November 9, 2017 at our lodge building at 312 West Fulton Street in Edgerton. Doors open at 6:00 p.m. and dinner will be served at 6:30 p.m. This free dinner is open to the entire community. Benjamin Franklin Lodge #83 and Fulton Lodge #69 will jointly be holding a Trap Shoot on Sunday, October 15, 2017 at Tronnes’ Pond located at 855 Washington Road, Edgerton, WI. Bro. Austin Tronnes has been kind enough to let us use his private shooting range, and all Masons and their guests are welcome. $5 at the door to cover the cost of pigeons, and food will be available. Bring your own ammunition and some quarters for games. Don’t have a gun? Bring ammunition for 12ga shotguns, as we should have some extra shotguns to loan. Fulton Lodge will host the Spring 2017 District 9 Meeting at our building at 312 W. Fulton Street, Edgerton, Wisconsin on Saturday, May 6, 2017. Door open at 8:30 am with coffee and light refreshments. Ladies are invited and encouraged to attend. 12:00 pm Adjourn – THANK YOU for being here! 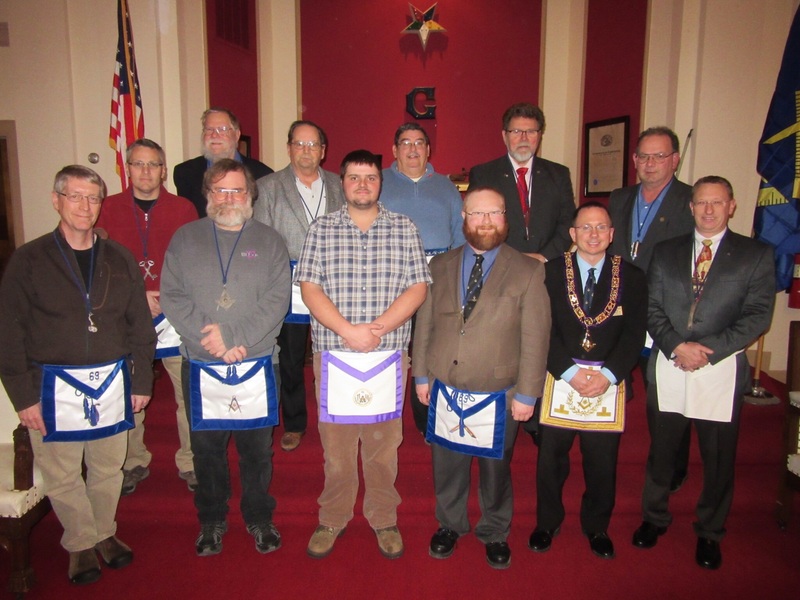 Public Installation on December 7, 2016 at 7:00 p.m.
Fulton Lodge № 69 will be holding a public installation of its officers on Wednesday, December 7, 2016 beginning at 7:00 p.m. All are welcome to this open installation, and Masons are encouraged to bring their family and friends as guests. Installing Master Erik Nielsen will be presiding. Dinner and fellowship to follow. Fulton Lodge #69 and Benjamin Franklin Lodge #83 will be celebrating Wisconsin Freemason Day by jointly sponsoring a Trap Shoot on Saturday, October 8, 2016 beginning at 12:34 p.m. at Tronnes’ Pond. Bro. Austin Tronnes has been kind enough to let us use his private shooting range, and all Masons and their guests are welcome. $5 at the door to cover the cost of pigeons, and food will be available. Bring your own ammunition and some quarters for games. Don’t have a gun? Bring ammunition for 12ga shotguns, as we should have some extra shotguns to loan. Not a Mason? Come find out who we are and what we do!